Steven Stepanek, chair of the Department of Computer Science and faculty president, will represent faculty interests on the 25-member board responsible for the oversight of the 23-campus CSU system. 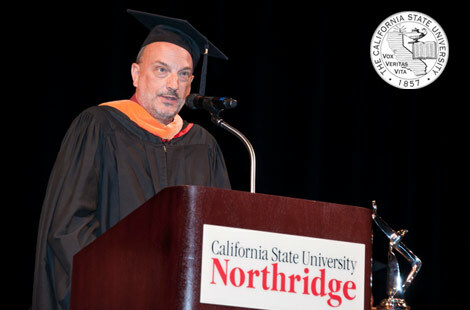 He will join CSUN senior Talar Alexanian, who was appointed to the board in July. Read more about the appointment. More than 200 community members attended the 10th anniversary celebration of the 18,400-square-foot facility, which provides water-based therapeutic exercise programs that give participants freedom of movement with little or no pain. Read more about the celebration. One of only 13 university teams selected by NASA, CSUN faculty and students will construct a shoe-box-size satellite that will launch into low earth orbit carrying an experimental payload from Pasadena’s Jet Propulsion Laboratory. Read more about the project. Thu., Nov. 14, 7 p.m. Thu., Nov. 21, 8 p.m.
Gain an insider perspective, ranging from facilities to marketing to sports management. Friends and former students and colleagues held a tribute on campus for the late Pete Accardy, who served as CSUN swimming coach for 24 years. The China Scholarship Council, funded by the Chinese government, awarded seven CSUN students and alumni full tuition and living expenses to study in China for a year.